On December 1, 2012, Disney Theatrical Group opened a special immersive “pop-up” exhibition to celebrate the Broadway smash production of The Lion King, known as “Inside the Lion King.” Considered the first of its kind, the exhibit gave travelers a chance to see over 100 items relevant to the creation of the show, ranging from shadow puppets to props, with the ability to see details that aren’t readily noticed from the theater seats. The exhibit also includes interactive elements, such as touch screen presentations of concept sketches and models, and photograph opportunities with set pieces. Posted in Uncategorized and tagged 2010s, Broadway, Event, Exhibit, Musical. Bookmark the permalink. On November 21, 1978, the exhibition Building a Better Mouse kicked off at the Library of Congress in Washington, D.C. Running until January 30, 1979, the exhibit celebrated Mickey Mouse’s 50th birthday as well as “fifty years of animation,” as it was advertised. It was curated by animation historian J. Michael Barrier, and featured over 120 items, ranging from production art, to merchandise, to books; these items were from a variety of sources, including the Disney Archives and materials already in the hands of the Library of Congress. Posted in Uncategorized and tagged 1970s, Animation, Exhibit, History, Merchandise, Mickey Mouse. Bookmark the permalink. On February 22, 1964, the below decks exhibition within the Columbia Sailing Ship opened to the public. The original Disneyland ship, based on the Columbia sailing ship that circumnavigated the globe in 1787, opened in the park on June 14, 1958. The historical displays created in the ship give guests an idea of the living conditions sailors faced in the 18th century, particularly those that joined ships like the Columbia to fill in details of the world map. Posted in Uncategorized and tagged 1960s, Disney Park, Disneyland Park, Exhibit. Bookmark the permalink. On March 29, 2012, the Smithsonian Museum in Washington, DC hosted an event called To Infinity and Beyond: Buzz Lightyear’s Journey to the Smithsonian, celebrating the addition of a special Buzz Lightyear figurine to the museum’s collection. The figurine, presented jointly by NASA and Pixar Animation Studios, was a special guest on the Space Shuttle Discovery that flew to the International Space Station. John Lasseter was on hand for the presentation and a special panel discussion that looked at Buzz’s journey through space. The figurine was then made part of the “Moving Beyond Earth” exhibit. Posted in Uncategorized and tagged 2010s, Exhibit, Museum, Pixar, Special Event. Bookmark the permalink. On January 21, 1955, the Dairy Bar opened in Disneyland’s Tomorrowland area. Sponsored by the American Dairy Association, it was a mix of a presentation about the future of milk and milk delivery and a quick service restaurant serving milk in a small dining room. The area did not prove to be as popular as other future-looking presentations within Tomorrowland, and was closed on September 1, 1958. Posted in Uncategorized and tagged 1950s, Closed, Disney Park, Disneyland, Exhibit, restaurant. Bookmark the permalink. On February 12, 2010, the Disney Cruise Line exhibit opened in Meyer Werft’s newly built area of the Visitors Centre. Meyer Werft, one of the world’s leaders of building luxury passenger ships, started building Disney ships in 2007 when Disney awarded the company a shipbuilding contract. The exhibit gave guests an opportunity to see the covered building dock where the Disney Dream was being built. A two-and-a-half-hour tour and walkthrough was offered for special guests as well. Posted in Uncategorized and tagged 2010s, Disney Cruise, Disney Cruise Line, Exhibit, International. Bookmark the permalink. On November 4, 2006, the new exhibit Disney: The Music Behind the Magic opened in Seattle’s Experience the Music Project. 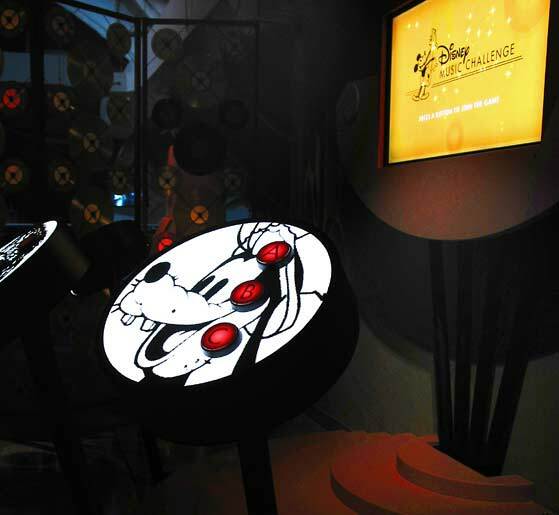 The exhibit, also honoring Walt Disney Records’ 50th anniversary, began in the 1930s with original scores and storyboards for the earliest Disney films, to the multitude of pop stars that have had hits through the label. The event also featured interactive elements for kids, including their own way of mixing vocals and creating sound effects. For adults, there were clips with explanations by musical experts, as well as pieces of important Disney milestones for all to see. The event ran until September 9, 2007. Posted in Uncategorized and tagged 2000s, Closed, Exhibit, Music. Bookmark the permalink.